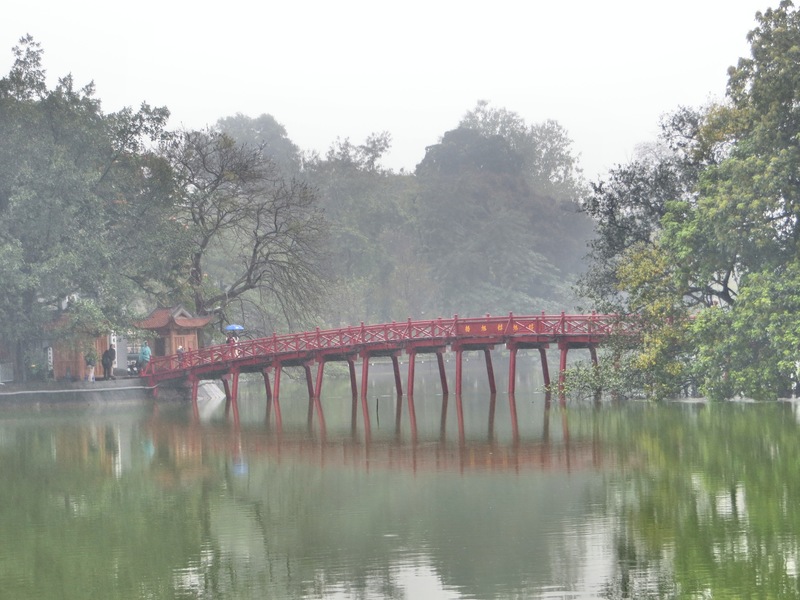 The Rising Sun Bridge, linking the mainland across part of Hoan Kiem Lake to a little temple on an island. For five days the city was misty, cloudy, grey, and beautiful. 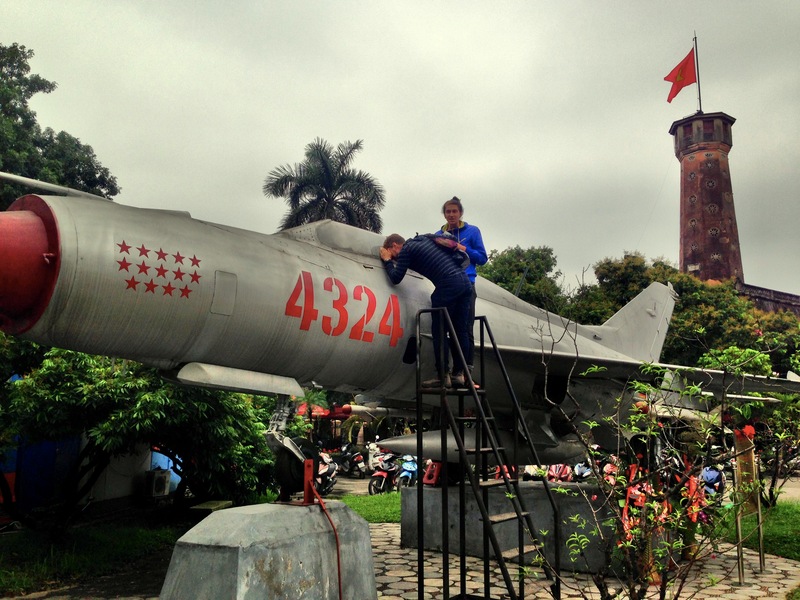 Hanoi is a seriously beautiful and fascinating city. French colonial architecture mixed in with all the jumble and noise that the historic city offers. Powerful history, some of which is true. Incredible food, a mix of traditional Vietnamese with a overlay of French. People smiling everywhere. 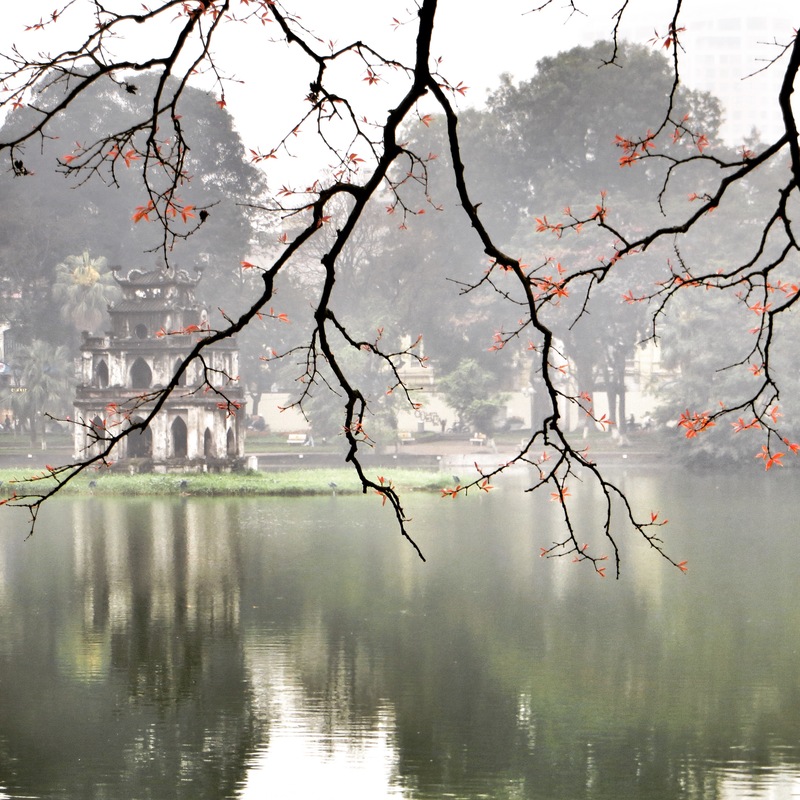 We fell in love with Hanoi when we first came in 2001 and while there have certainly been changes, we still love it. Where to start? We spent five days here, and during the entire time it was overcast, cool, typically misting, sweater and even jacket weather. I’m a sun worshipper at heart, but even I loved the atmosphere created by the gloomy weather. 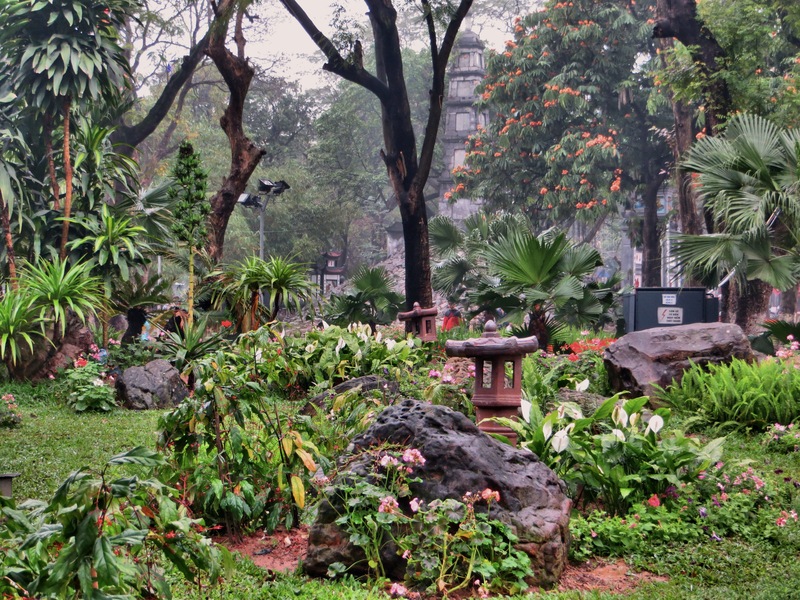 We stayed just a quick block from Hoan Kiem Lake, the scenic lake that is essentially the focal point of the city. Early mornings I’d go running around the lake along with untold numbers of Vietnamese walking, jogging, playing badminton, practicing tai chi, doing line dancing. The rest of the day there were always photographers out catching the eerie beauty of the lake. 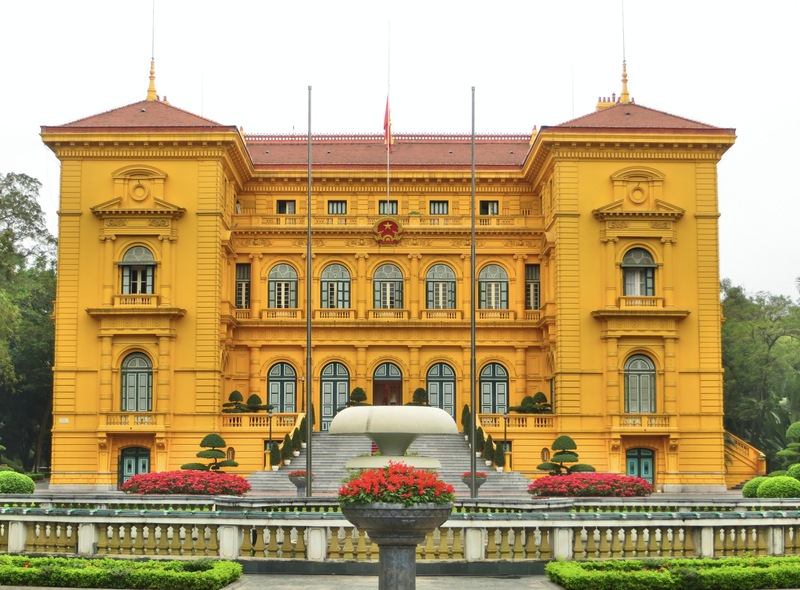 Part of our love affair with the city was based on staying at the Metropole Hotel, the place to stay in Hanoi since it was built in 1901. Everyone from Bill Clinton to Brad Pitt and Angelina Jolie have stayed here, and yes, it was home to Jane Fonda during her notorious visit in 1972. It remains a beauty, a colonial masterpiece, with it’s own interesting history. Just a couple years ago, during a partial renovation, they discovered the old bomb shelter that was built in the early 1960s and used many times, particularly during the Christmas bombing campaign in 1968. 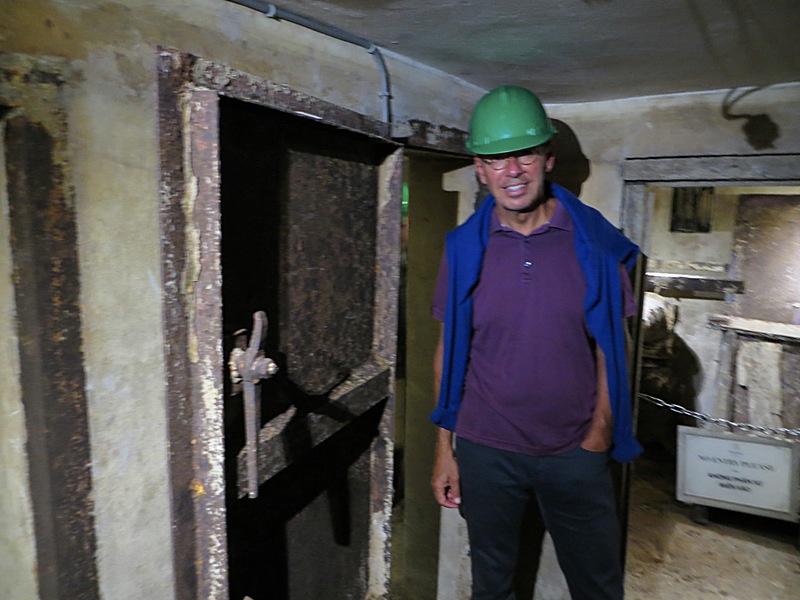 A fun little opportunity is offered to hotel guests to tour the bomb shelters so Mark & I headed down there one night. Let’s just say I wouldn’t have wanted to spend much time down there. 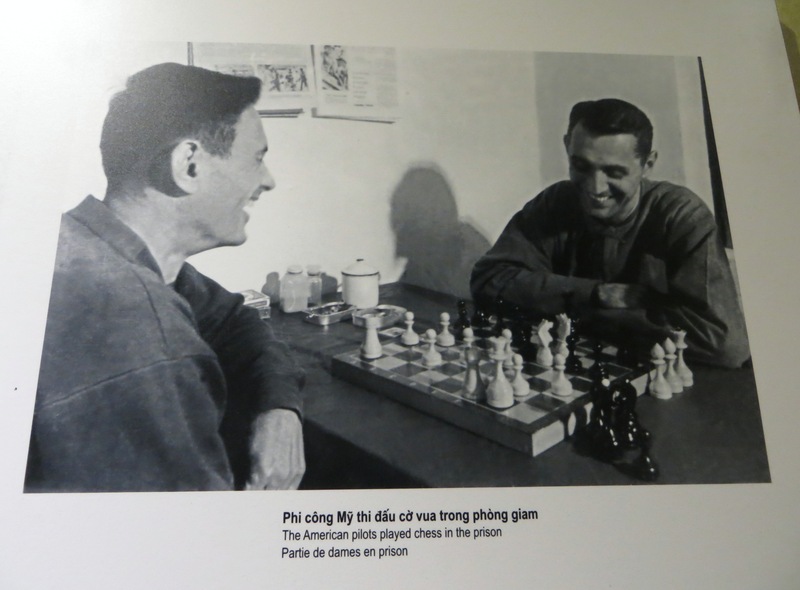 Another piece of history worth exploring was the Hoa Lo Prison, known to American POWs as the “Hanoi Hilton.” Long before John McCain ended up there, it had been built by the French in the late 19th century to control the Vietnamese, and most of the museum is built to document the mistreatment and horrendous conditions Vietnamese patriots were subjected to; a guillotine displayed prominently makes the case pretty vividly. US pilots,” given the economic conditions they faced. 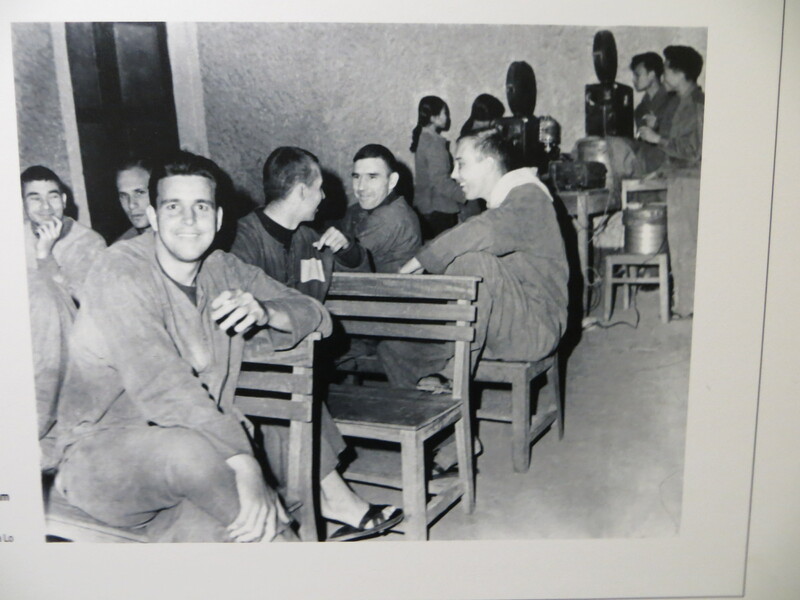 There are pictures of POWs (including a young John McCain) receiving medical care, watching movies, playing chess, and just generally having a great time. My memory from stories that came out when the POWs came home wasn’t quite so benign, so I figured I’d look at what he had to say about it. 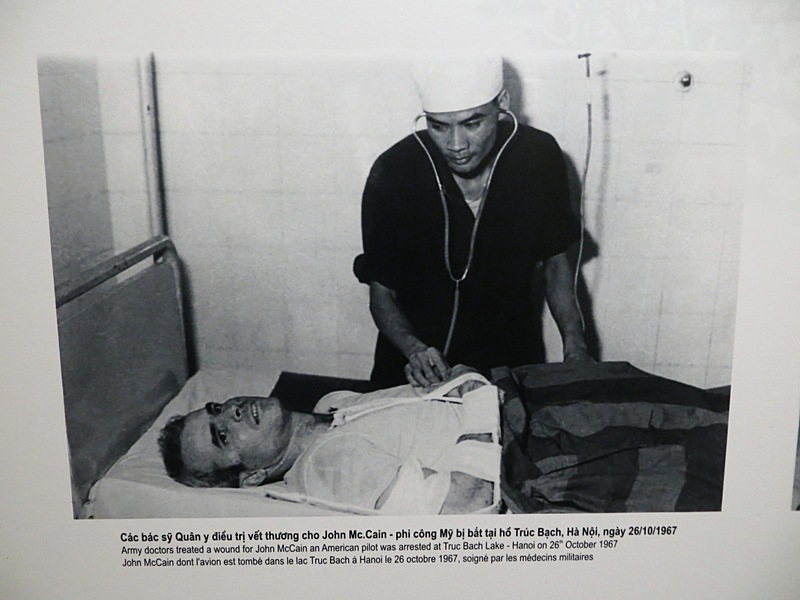 According to Wikipedia, “Although McCain was badly wounded, his captors refused to treat his injuries, beating and interrogating him to get information; he was given medical care only when the North Vietnamese discovered that his father was a top admiral.” As McCain himself said after he was released, explaining the anti-American statement he’d ultimately agreed to make, “I had learned what we all learned over there: Every man has his breaking point. I had reached mine.” Not quite the picnic the museum puts forward. 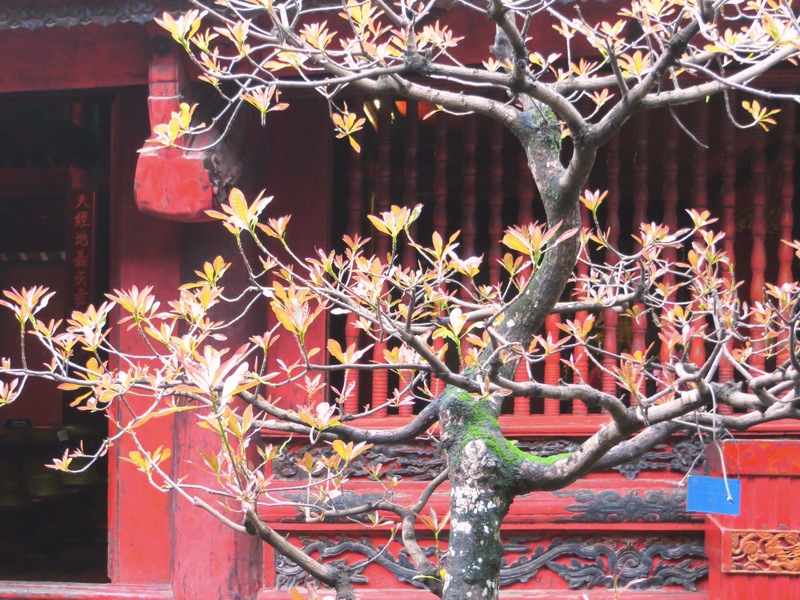 Another highlight in Hanoi is the Temple of Literature. 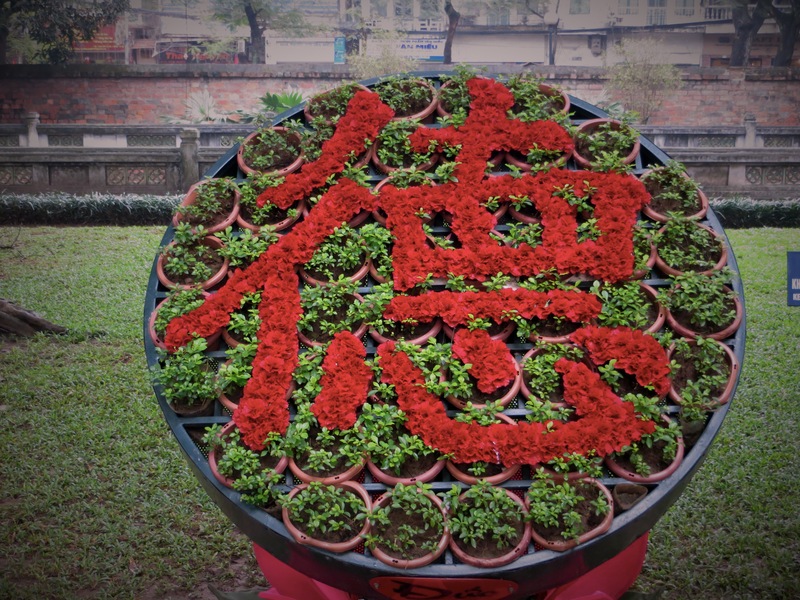 Established in 1070 AD, it is dedicated to Confucius and honors Vietnam’s finest scholars and men (sic) of literary accomplishment. The country’s first university was founded there in 1076, and the site remains an island of calm in a boisterous city. 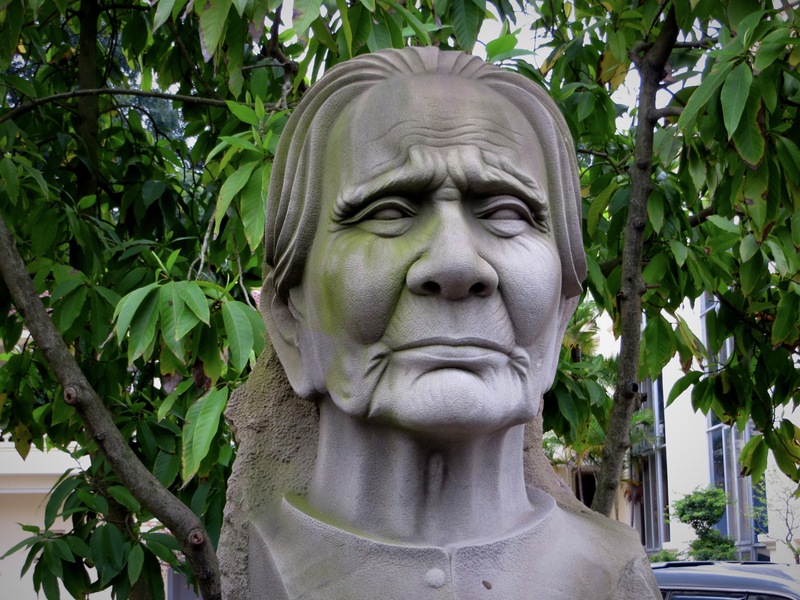 Of course, it’s hard to imagine a major site honoring scholars and literary giants in the U.S., but it works in Vietnam. 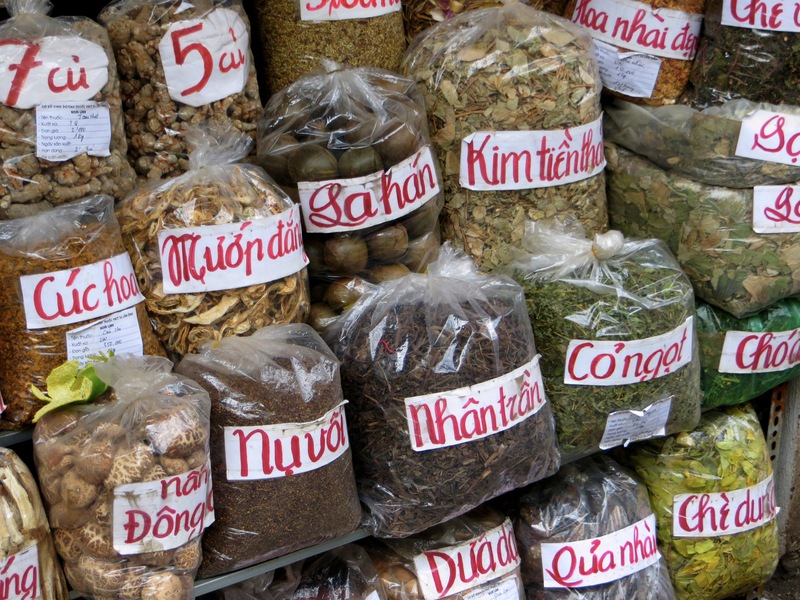 Otherwise our time in Hanoi was the typical blend of long walks, great food, and just drinking in all the flavors and smells and sounds that the city has to offer. 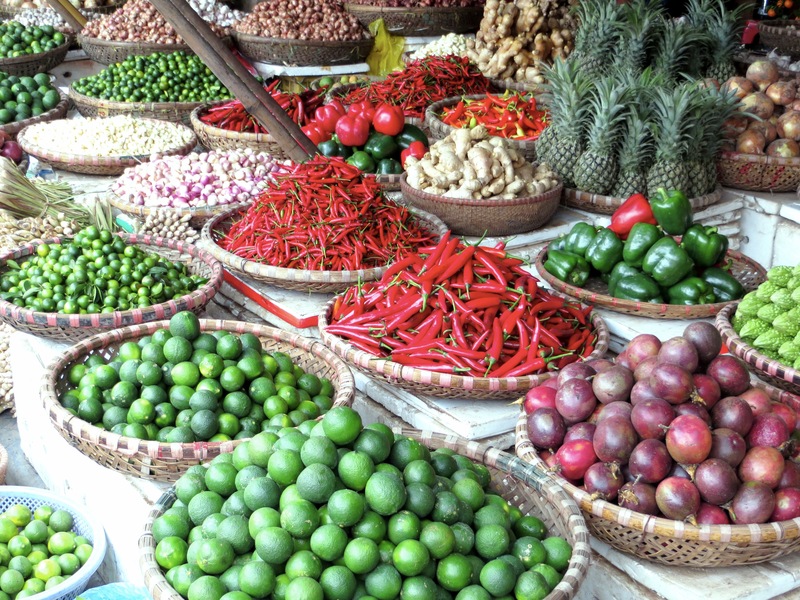 It’s hard to leave, but this is our last stop in Vietnam. We’d expected to go to Halong Bay, and perhaps north to Sapa to do some hiking. 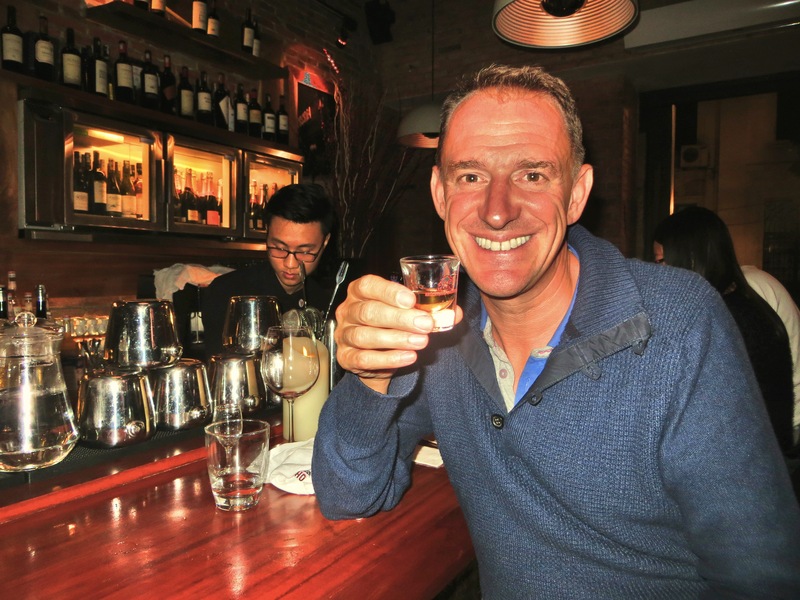 Between the cool, still-wintery weather (for Vietnam), though, and problems with Mark’s knee, we decided instead to head up to Hong Kong. For now, then, we’re done with Vietnam but I suspect we’ll be back in a couple years when the weather is pleasant here in the north to renew our love affair with the country. The kitchen in a classic, renovated “merchant’s home” in the old section of the city. 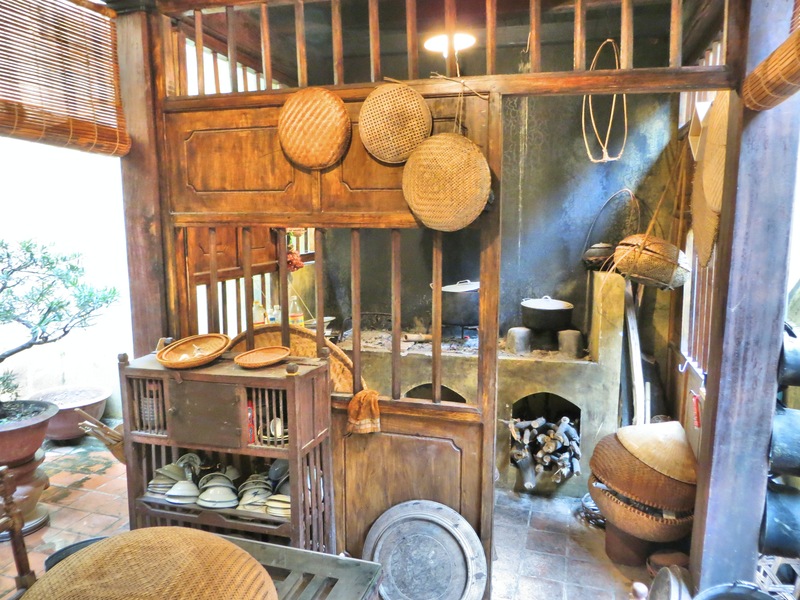 After the communists took over, the house was used by five families, all cooking in this one kitchen. Mark saw this in the Temple of Literature and immediately recognized it as the Chinese word for “German.” On further research, it’s also the word for virtuous, a more likely explanation in this temple. 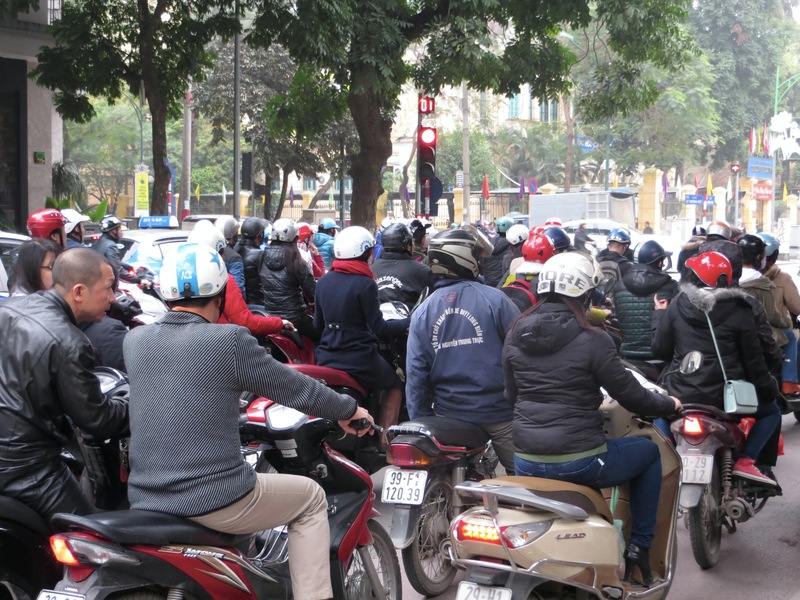 The traffic in Hanoi is a seething life form of its own unique nature. Traffic lights are suggestions. Crosswalks have no meaning whatsoever. Honking your horn means “I’m coming through no matter who or what is in the way.” And since sidewalks are given over to scooter parking and shops and tiny restaurants, pedestrians share the street with all these scooters and cars. 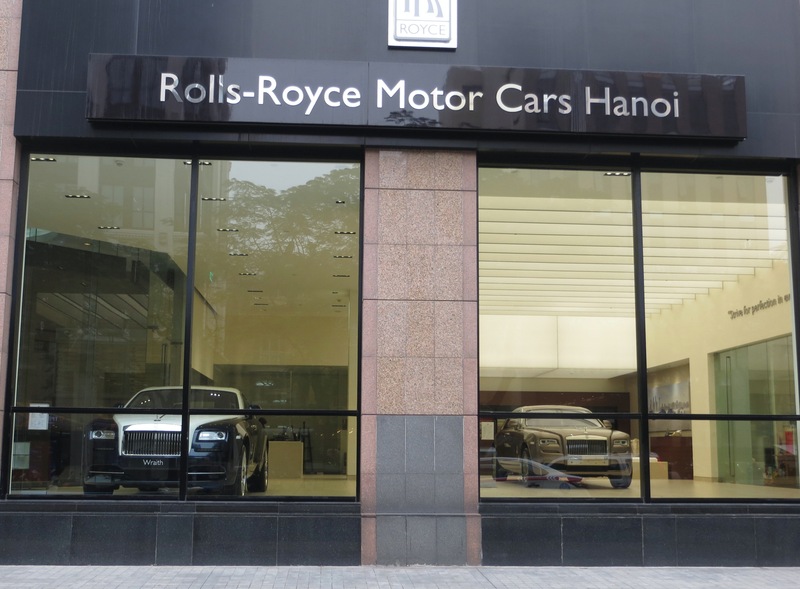 In Hanoi’s Old Quarter, the shops on one street will all be selling shoes, another street is all tin boxes, the next one is locks and door handles. This street was herbs and spices and smelled amazing! The Military History Museum has a few dozen old planes, tanks, and other assorted war hardware, including this MIG-21. Given all I’d heard about MIGs over the years I was pretty surprised by how small it is. When you climb up to look into the cockpit you’re stunned at what a tiny space they had to work in. 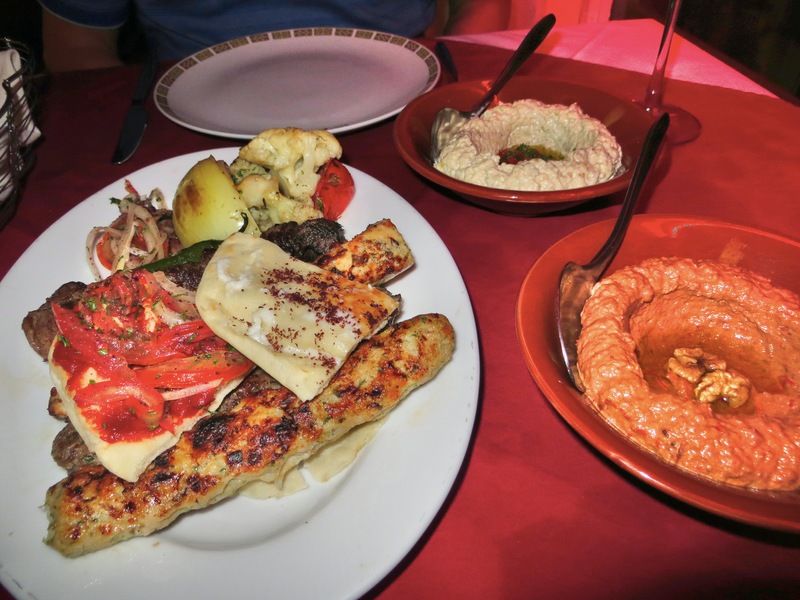 We discovered a great Lebanese restaurant one night, named Beirut, no less. Belly dancers appeared.